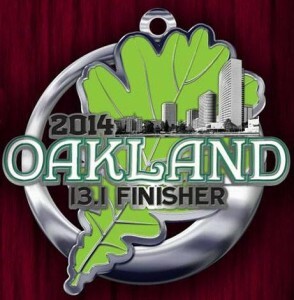 Oakland 1/2 Finisher’s Medal Revealed! The 2014 Oakland Half Marathon Finisher’s Medal has been revealed! That is one nice piece of hardware! And since we’re on the topic of medals, I have a confession. I run for the race “bling”. Anyone else with me on this one? For me, it’s not the shirt. It’s not packets of energy gels they have at Mile 10 (which, btw, is ineffective at that point in the race, in my opinion). It’s not for the blisters or jacked up toenails. And it’s certainly not for the post-race food provided after you cross the finish line. It’s all about the medal. I guess you can call me a race snob. I think I have every right to be, too, especially since I’m spending $75-100 on races these days. I want to know that I’m getting my money’s worth. And how would I know if the medal will meet my standards? Simple. I Google search images of medals from that particular race in previous years and determine whether or not I want to sign up for it. Nothing irks me more than spending two plus hours running, only to be “rewarded” with a mediocre medal. Ahem…insert SF Half Marathon here! 7 Responses to Oakland 1/2 Finisher’s Medal Revealed! THIS WILL BE MY FIRST MEDAL!!! ha! the first couple medals i got were for hood to coast and those are barely bigger than a postage stamp, so i was like “what the heck is this? !” when i got my first big one. last year’s OAK half medal is about as big as thor’s face. This will will be an awesome addition to the Chengheimer trophy room. This makes me love you even more. ACCESSORIES MATTER!!!!!!! My first race medal is the Tinkerbell one. You’ve just inspired me on how I am going to pick my future races: choose the CUTE medals!!! !